The lines between intent and ineptitude are often virtually indistinguishable in Danny Boyle’s lackluster low-budget “zombie” flick 28 Days Later. In the lame prologue, animal rights activists accidentally loose a highly contagious virus that unleashes pure human rage in those it infects upon the populace. Boyle immediately sets forth an unattractive aesthetic of lousy DV backdrops (the final moments are shot on film, almost as a reward for surviving the muddled digital hell of the preceding footage) and action scenes that offer disjointed flashes of mayhem instead of genuine suspense. Apparently the legacy of the Blair Witch phenomenon is the belief in filmmakers that visuals aren’t important and incoherency is scarier than anything viewers can actually comprehend. After the 28 Days Later title card comes up, things improve a bit, and Boyle starts establishing a feel that’s, at least for a while, closer to the old “Twilight Zone” TV show. Attempting to convey an epic feel on a relatively low budget, the movie introduces us to an amnesiac protagonist who wakes up to an eerily empty London. Though the constraints of the digital photography and the static camera definitely lessen the epic feel here (compare the effectiveness of Tom Cruise’s Times Square nightmare in Vanilla Sky), there’s still something unnerving about the sight of urban man reduced to a few scant pixels in an expanse of civilized nothingness. Unfortunately, it only goes back downhill from there. Before long, our hero hooks up with a pair of survivors who inform him, in a huge, boring chunk of amnesia-justified exposition, that England is now overrun by rage inflicted, murderous humans, who act like the zombies of any given horror flick, but run faster. As the people the protagonist talks to describe the preceding month, there’s no escaping the impression that the 28 days prior would have made for a more exciting movie. Since the budget of the film is so tightened, we only get to hear verbal accounts of past horrors instead of getting to see visual recreations, and the monologues hardly well enough written or acted to boost suspense, though the lack of audience interest in the superficial characters doesn’t help much either. Boyle’s attempt to convey an epic feel here is evident. His large-scale but hackneyed plot recaps both Dawn and Day of the Dead. That ambition is at odds with the general cheapness of the production. It’s never convincing that any two blocks of London have been taken over, much less all of England. To say that nothing is as scary here as in Romero’s zombie classics is perhaps obvious, but 28 Days Later also lacks the style of a Resident Evil or the humor of something like Dead Alive. Given its vision of an abandoned city and its subsequent shopping montages, the genre piece that it most closely resembles to my eyes is the wonderfully campy Valley girl vehicle Night of the Comet, which had the benefit of not taking itself very seriously. One might expect a film that seems to revel in its technical shoddiness to make up for its lack of formal control with inventiveness, but when 28 Days Later tries for suspense it falls back on horror movie clichés such as a car that won’t start and a demonic child. Still, those moments, however familiar, play better than the equally shopworn, heavy-handed speeches about the meaningless of life in a world gone so wrong and the tired insistence that man is actually a savage beast at his heart. 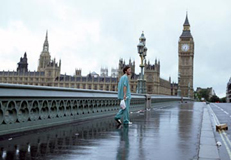 Though it’s hardly a complete disaster, there’s something distinctly stagnant about 28 Days Later. When, right before the finale, one character gives another some valium so she “won’t care” what happens next, it seems an attempt to make sure those on screen and off are all on the same page.